The leader of India's governing Congress party, Sonia Gandhi, is back at work a week after she returned home having undergone surgery abroad for an undisclosed medical condition. Mrs Gandhi chaired a meeting of the party's election committee on Thursday to finalise candidates for the upcoming elections in Uttar Pradesh state. She was fully engaged during the hour-long meeting, a party spokesman said. Mrs Gandhi holds no official post but is India's most powerful politician. The 64-year-old Italian-born politician is seen as a key decision-maker in the government. Correspondents say her presence at the meeting has been reassuring for party workers since the government faced serious problems during her month-long absence. Prime Minister Manmohan Singh's government was severely criticised for mishandling anti-corruption protests in August by social activist Anna Hazare. Many commentators said that if Mrs Gandhi had been in Delhi, she would have handled the situation better. "She conducted the meeting in the usual manner," news agency AFP quoted Congress spokesman Janardhan Dwivedi as saying. "Mrs Gandhi received the prime minister and then saw him off after the meeting but it will take her some time to return to her earlier speed of functioning," he said. When Mrs Gandhi returned to India on Thursday last week, it was said she would need at least a month to resume work. The party has consistently refused to comment on the nature of the illness or where she went for surgery. But media reports have suggested she was treated at a specialist cancer hospital in New York. Mrs Gandhi is the widow of former Prime Minister Rajiv Gandhi. She nominated Manmohan Singh to the prime minister's post in 2004 but is frequently portrayed as being more powerful than him. 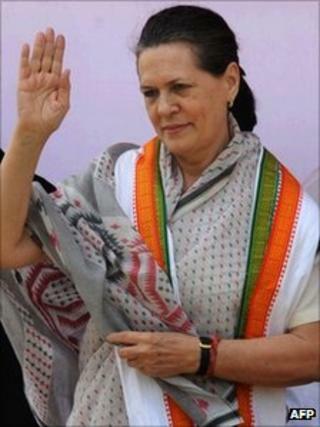 She is at the head of the Nehru-Gandhi dynasty, which has ruled India for most of the time since independence in 1947. Mrs Gandhi had named a four-member team to run party affairs during her absence. The team included her son and MP Rahul Gandhi, who is tipped as a future prime minister.